Speckled Lynx, originally uploaded by madcalabrian. Photographed at Grassy Waters East. It’s rare that I use a tripod for my macro shots, but this particular speckled lynx spider was very cooperative and gave me ample time to setup and take numerous shots. 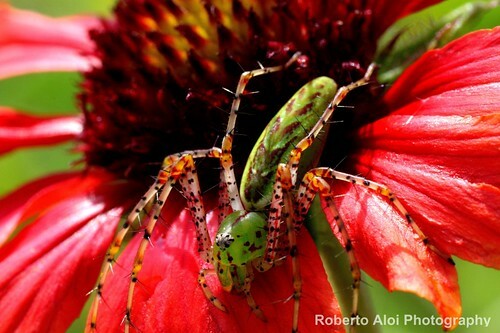 Lynx Spiders are hunting spiders that spend their lives on plants, flowers and shrubs. Nimble runners and jumpers, they rely on their keen eyesight to stalk, chase or ambush prey. Six of their eight eyes are arranged in a hexagon-like pattern, a characteristic that identifies them as members of the family Oxyopidae. They also have spiny legs.